During work tasks, children often want to know when there is a break time or a time to choose a reinforcer. 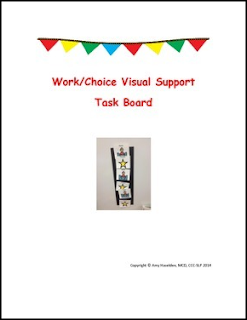 I use this visual work/choice board in speech therapy to let them know if they complete work for me their choice (reinforcer) is next. This has alleviated a ton of behavior issues in my speech room especially with children with developmental delays, who may be non-verbal, and children with autism.